“Only Lovers Left Alive” has its Madison premiere on Wednesday, Sept. 17 at 7 p.m. at the Madison Museum of Contemporary Art, 227 State St. FREE for museum members, $7 for all others. R, 2:02, three and a half stars out of four. They’re a middle-aged married couple who enjoy reading a great book, listening to rock on vinyl, and the occasional glass of a full-bodied red. 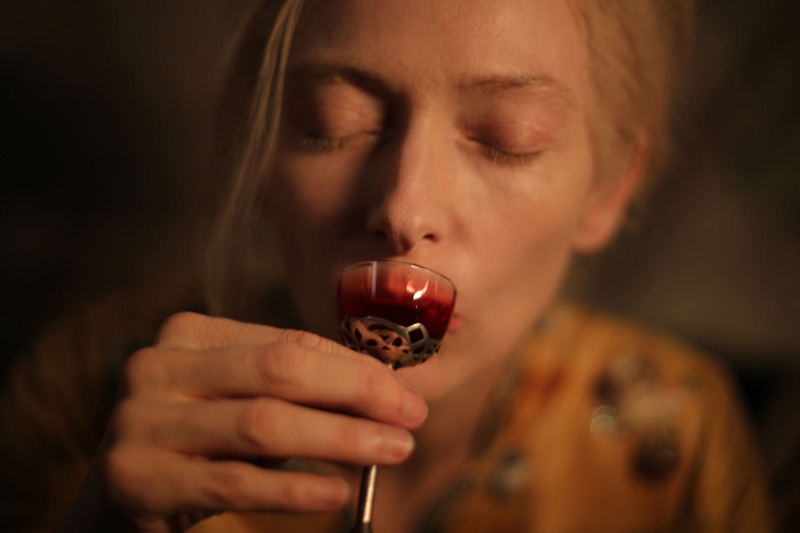 You can keep your buff, brooding bloodsuckers of “Twilight” and “True Blood.” The vampires in Jim Jarmusch’s “Only Lovers Left Alive” are Madison’s kind of vampires. Fitting, then, that the Madison Museum of Contemporary Art rescued Jarmusch’s delicious film and are kicking off the fall Spotlight Cinema series with its Madison premiere, and on a 35mm print to boot. It’s not really a horror film, but a clever and luscious extension of Jarmusch’s lifelong celebration of the outsiders in society, the ones who don’t fit in and never will. If there’s any horror here, it’s the horror that the vampires feel towards us, the human race, desecrating the planet with our wasteful, mindless mediocrity. “Only Lovers Left Alive” may be a vampire film to us, but it’s a zombie movie to them. Adam (Tom Hiddleston) has retreated into seclusion in Detroit, the decaying city out his window reflecting his dim view of society. He’s a musician who has gone full Brian Wilson, making noise-rock epics with vintage guitars and analog four-track recorders in his private studio, never to be released. His only contact with the outside world is Ian (Anton Yelchin), sort of a roadie Renfield who procures vintage guitars and other rarities for Adam. When Adam gets hungry, he dons a surgeon’s outfit and sneaks into a nearby hospital, where his physician supplier (an amusing cameo by Jeffery Wright) slips him a few vials of quality blood. Adam is too refined to actually bite someone on the neck; and, after all, most humans have so many toxins in their blood that it’s hardly worth the effort. Adam prefers his blood locally sourced. Half a world away is Adam’s wife, naturally named Eve (Tilda Swinton). Where Adam is a brooding recluse, Eve wanders happily through Tangier, reading great books, playing on her iPhone and drinking in the local culture (although not literally). Her confidant (and supplier) is none other than poet Christopher Marlowe (John Hurt), who over the centuries has grown pretty sick of being asked if he wrote Shakespeare’s plays. Eve calls Adam, and pops over to Detroit for a visit (the book-packing montage alone will send literature majors into dizzy paroxysms of joy). They make love, drive by Jack White’s childhood home, and talk about music and literature. Jarmusch’s has constructed them as yin and yang — Adam all in black, Eve in a fetching off-white, engaged in an eternal love story that transcends time and distance. But it’s also an elegaic one as well, as the lovers search for the remaining scraps of beauty in a fading world. Its self-destructive ethos is best embodied by Eve’s younger sister (Mia Wasikowska), a party girl who leaves a trail of damage (and punctured necks) in her wake. You want to drink up every last drop of the images Jarmusch conjures up, lit by the metallic blues of Detroit and the burnt oranges of Tangiers. The editing is fluid, even languid at times, as Jarmusch lets his camera linger on a band playing in a Detroit club or a long cab ride through the curving streets of an African city. There still is beauty in this world, as harsh as it can be, and “Only Lovers Left Alive” knows where to look.